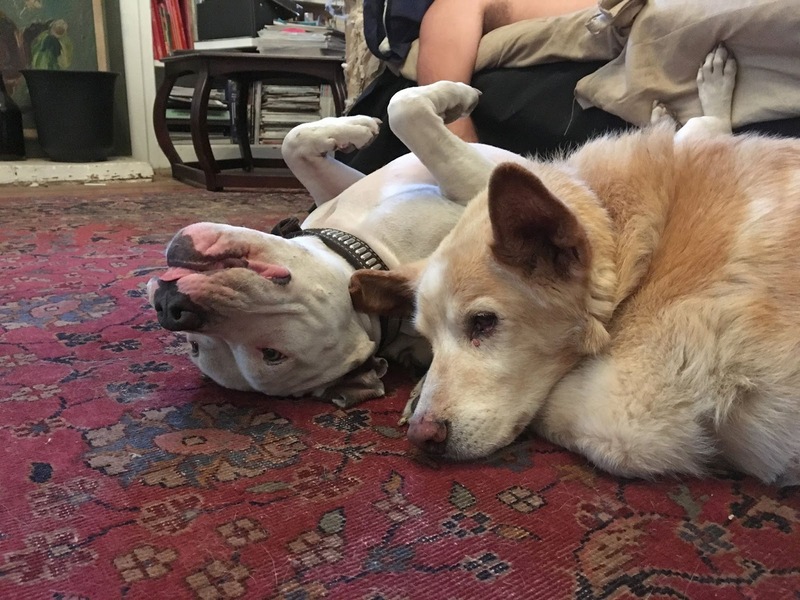 When Amy and James asked to adopt Matzo Ball, they told us they had two cats at home, in addition to their two dogs. Would it work? The cats’ personalities factored in to the equation as much as Matzo’s. Amy and James told us that one of their cats was fearless and would likely rush Matzo, while the other cat would probably be nonplussed. Knowing that a rushed intro would be more than Matzo could handle, they set up a plan to create the best success. During this intro period, Matzo was with them under a foster/adopt contract and he was marked as having a ‘pending’ adoption. We agreed to hold off on going full adoption until the household had found a healthy and successful rhythm between all the various creatures. A good game plan, good communication between the humans. Plenty of patience, time and a can-do attitude. 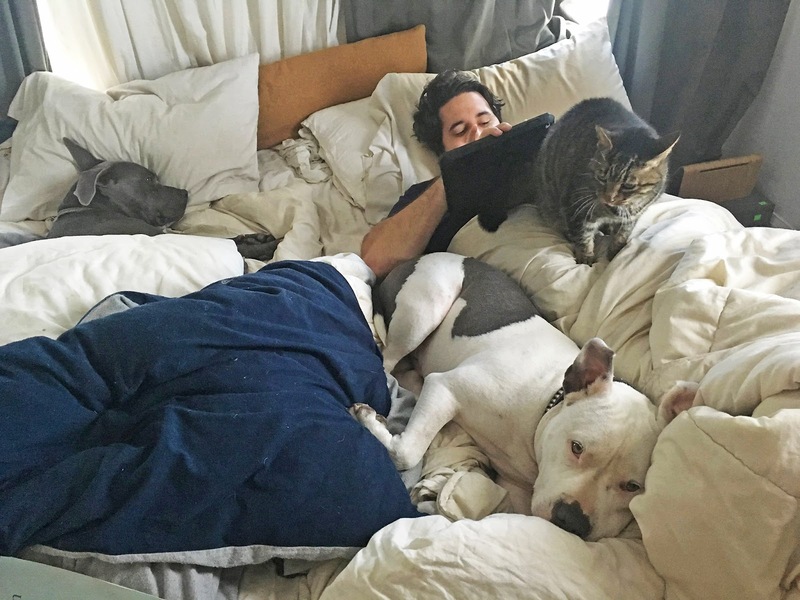 "Matzo had no visual contact with the cats at first -- We wanted him to just get used to their smell. We closed off the room with Matzo’s crate so our cats couldn’t get in and so he couldn’t see the cats. The way our house is laid out allowed us to also vary the amount of space between Matzo and the cats -- we started with three sets of closed doors between everyone, then went to two, and then one (plus a crate). We’d also periodically bring Matzo into the rooms that the cats had been hanging out in so he could investigate their smells, and brought some of the cats' beds to him, too. Our biggest challenge during this phase was actually our brave cat, who wanted to see Matzo so badly he tried to sneak into the rooms he was in. We didn't want Matzo's first face to face with the cat to be when he was excited, so having a cat run at his crate head-first was not part of the plan." 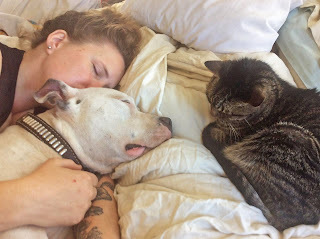 "Once Matzo thought smelling cat bedding was boring, we had our cats in adjoining rooms so he could get used to their sounds without actually seeing them. Any extreme excitement -- attempts to paw at the door, whining, or get into the room with the cats, for example -- were discouraged immediately with a sharp NO and, if he persisted, a quick spray bottle squirt. The challenge with this phase was again our brave cat: when she heard Matzo sniffing the door, she would stick her paws under the door to get at him. This was the longest, most challenging phase for everyone; the cats didn’t like being cooped up, and it was difficult for Matzo not to get excited when our cat initiated a game of Whack-a-Mole under his nose." "Once Matzo was consistently showing appropriate interest in the cat paws emerging from under the door -- polite sniffing, but no whining, pawing, barking or fixed staring -- we let Matzo see the cats for the first time. We started with him in his crate allowing him to see us holding a cat through a glass door in the next room. If the cat wanted to leave or if he showed any overt excitement -- barking, whining, panting, pawing, fixed staring -- we told him no, removed the cat and redirected his attention." 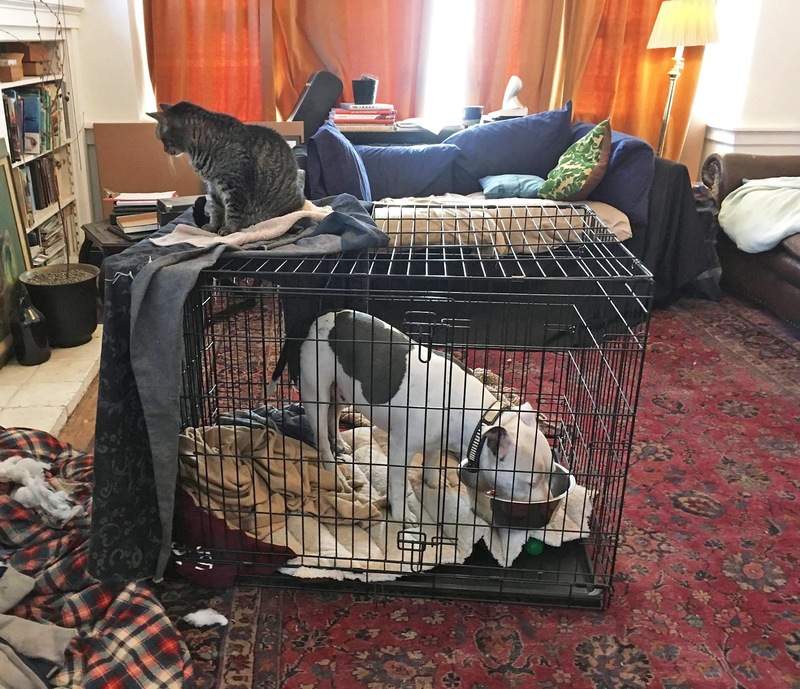 "Once he was appropriately calm when he saw a cat through the door, we tried bringing the cats into the same room with him while he was in his kennel. Next, we had our cats in the same room as him while he was on at tie-down. And then finally, Matzo could be on leash with the cats in the same room. This phase didn’t actually last long. Again, our brave cat was more of a challenge than Matzo. When she saw the dog, she’d try to get away from us and run over to him. When Matzo was calm on leash around the cats, we allowed him some off leash time in the room. We made sure there were always places for the cats to retreat to if interacting with Matzo was too much, and supervised these interactions extra closely. We were lucky that our cats were already very calm around dogs -- they don’t run away when they see a dog, which means that there are few opportunities for Matzo (or our other dogs) to chase the cats. Being around our other dogs who knew the rules about cats also helped Matzo learn pretty quickly." "Our cats are also indoor-only cats. Matzo will still bark at and chase the feral cats in our neighborhood that wail on our fence. He still doesn’t have unsupervised interactions with our cats. 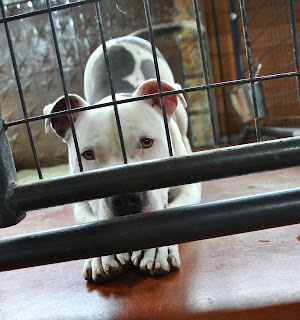 When we’re not at home, he stays safe in his crate… although our brave cat’s favorite sleeping spot is on top!" Three cheers for smart adopters and their agreeable animals. So excellent. I'm very happy for the whole family. I've been privileged to introduce two different Amstaffs to the wonderful world of cats. Both adored the cat and were very gentle their whole lives. Takes time and patience. Would this work similarly when introducing a cat to our dog? We have a coonhound mix (about 70 lbs) that we have had for 5 years. We adopted him when he was about one year old, so we don't know what the first year of his life was like. He is very interested in cats when we see them on walks. He first stops and stares at them, then starts baying. We would love to adopt a kitty, but don't know how to do it safely. He has never been in a crate. He is usually a very calm, well behaved dog and we just have never had the need for one. If the cat is the one being introduced to the family, which one would you crate? Any advice you have for us would be MUCH appreciated! Thank you! This is a great story! Full of great information. 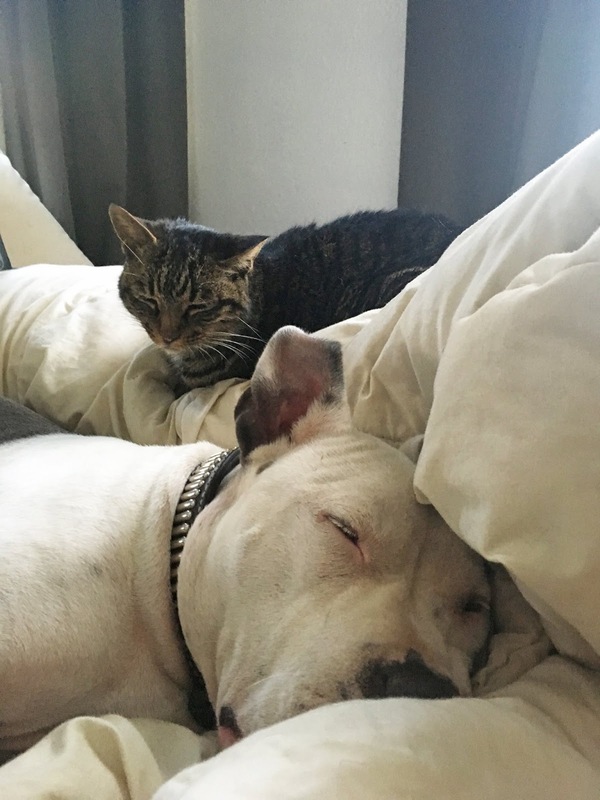 My pit bull has always been good with cats. He even snuggles with my parents cats lol. I'm glad your pitty Was able to get used to the cats. I love happy endings! 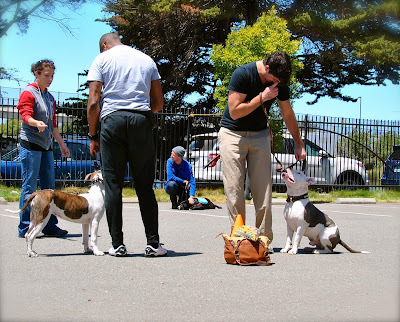 Especially when pit bulls are involved! Keep spreading the good word of pit bulls!